Mostly, it was lovely. I had lots of cards, a lovely box of goodies from England, a birthday cupcake, roses and gifts from my husband. Her Royal Highness Princess Lilibet III (pictured above - and called Lily for short) decided to give me a gift also. Marty (the bathroom man) had just finished the first coat of paint on the bathroom walls. He had gone to lunch to allow it to dry before he did the next coat. Lily decided to inspect his handy work. She has been poking her little nose in all the time.......you may remember him calling her a "Little Ship".........or something that sounded similar.......once before. Anyway, he had gone when I noticed she was in the bath AGAIN so I yelled at her. Have you ever done this :- Just as the words "get out of there" were leaving my lips I noticed the paint tray on the floor which still had beautiful teal colour paint in it. Everything went into slow motion as I could see exactly what was going to happen next. It was too late to stop the shout leaving my lips and a startled Lily did just what I knew she would do. She jumped out of the bath into the paint and then took off around the house. She left teal foot prints through the living room, up the stairs and into the bedrooms. I knew I had to catch her before she tried to clean it off her feet because it might be toxic. My next job - ON MY BIRTHDAY - was washing a very angry cat. I got her into the upstairs bathroom, ran a sink full of water and started washing her feet. She called me ever swear word that exists in kitty language. I have to admit I yelled right back at her...."We wouldn't be doing this if you would keep out of things you have no business in. It is your own fault." The battle was fierce but I prevailed. I did give up when I was trying to dry her feet and she was making this low, bloodcurdling growl. No sense pushing my luck ....let the bugger dry her own feet. When Marty came back I was still tracking down paw prints and cleaning the carpets. He seemed to find it amusing but I suppose he saw it as only fair, since she has been a little snot to him too. I thought she would probably be mad with me for hours but 10 minutes later she came flouncing back, tail up and floofy.........and sat on my lap purring. I think he was smiling and it sounded like he was saying "Cooking fat." What a funny thing to say!! 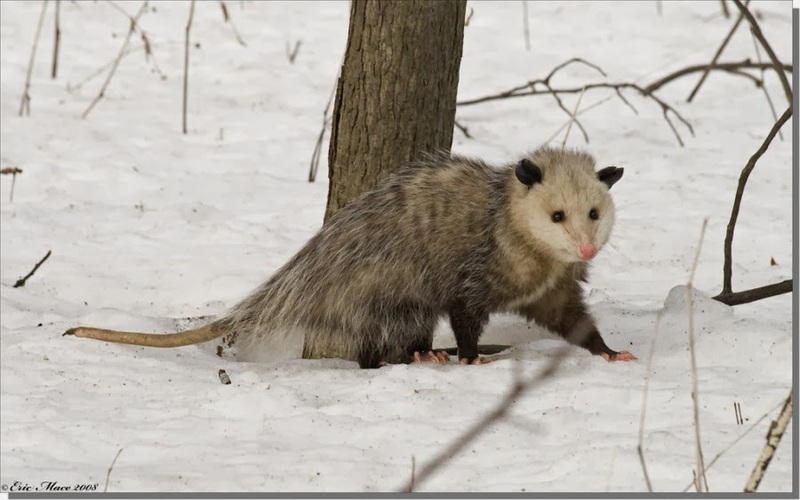 We had a bit of a thaw and unfortunately the receding snow revealed the body of Blossom our visiting possum. Oh it was so sad. As I may have mentioned, it has been bloody cold (even for Wisconsin), this winter. I don't know how old Blossom was but she didn't make it. I was quite upset about her. They are gentle, timid creatures. I have still been putting food out each night. A bowl of dry cat food (for the stray I occasionally see wandering and anything else that is hungry), leftovers, biscuits and sometimes a sandwich. Anyway, it is still being eaten. I wondered if it was raccoons but I haven't seen any lately. The other night as I went to close the back gate.......there she was........Petal, our latest possum. She sat there looking worried, like only possums can, and I crept quietly past her to put out the food. I am assuming she is a she as she isn't anywhere near as huge as Arnie, another possum we once had. 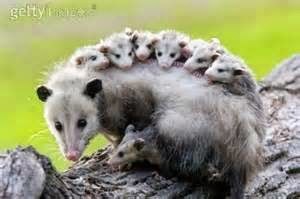 Possums are marsupials (the only ones in America I believe) and when the babies get too big for the mother's pouch she carries them on her back. Wouldn't it be fab if Petal brings her babies to visit us? The only thing left to do is the painting - I think. We shall go out and buy some new towels, bath rugs etc when it is totally finished. It snowed again yesterday and the temperature has really fallen again. They say it will warm up at the weekend. It bloody well wants to. Even Wisconsinites are complaining about this winter now. This gave Philip quite a start on Friday. 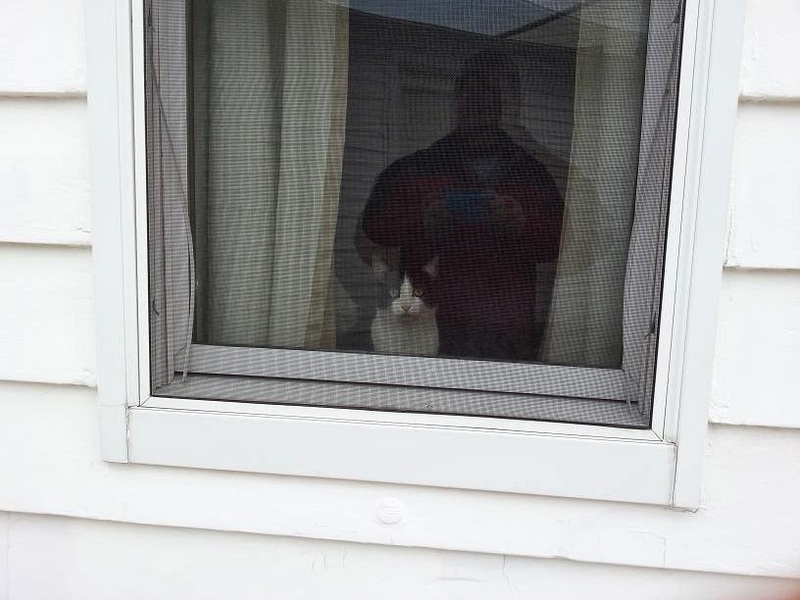 Lollipop always used to sit in this window and watch for us to come out of the garage. On Friday Sally was sitting in this window. She looks quite similar to Lolly and we only remarked the other day that we still look for Lollipop when we come home. Still miss our little girl. The archeology course is progressing. Every week when I get the new set of lectures, I sigh and decide I really don't think I can do it. There is quite a lot of reading apart from the lectures. Then there is an essay to complete and a test. I haven't done too badly so far. My results are better than I expected but I won't tell you what they are until the course is complete. I rather like Eddie Izzard's interpretation of archaeologists. Do have a peek....it is very short. The bathroom is taking a little longer than anticipated. This is mainly due to 'unforeseen circumstances' as they say. There was a faulty part in the shower tap thingie that has to be replaced. Hopefully all will be finished this week. The snow has very nearly gone. We do still have a few snow mountains but most of the ground cover has gone. It is now very cold again and there is more snow predicted for Tuesday/Wednesday. They haven't said if there will be much accumulation yet. The bathroom is starting to take shape. The cabinet, sink, shower doors, lights and most importantly........the toilet, still need to be installed. Oh...and the painting too, but, I am beginning to get an idea of the end result.....and I like it. It will be as Art Deco as we could afford and hopefully, will never need doing again. Marty's youngest son, Austin, has been visiting when he comes out of school. Yesterday and today I did have a bit of fun at his expense. It took me back to the days lost in the mists of time, when I had carte blanche to wind up kids. We were talking about the pyramids. Since I am now turning into Indianella Jones, I a had TV program on about Egypt. Anyway, he asked me if I knew what pyramids were and proceeded to tell me about Transformers and pyramids and how one pyramid had a white bit on the top. I then explained to him that, that was were the ancient Egyptians kept their pajamas. He seemed a bit suspicious of this but I went on to explain that it was the same as the way we keep our pajamas under the pillow. The ancient Egyptians all kept their pajamas under the top of the pyramid and then when it was bed time they all climbed up there and put their pajamas on. I think I convinced him ...........eventually. Back to the Transformers. He told me about Dynobots and how they looked like dinosaurs but were transformers...and...and...there was one who's name was Sam Witwicky. I asked him if he knew about the one called Fred Itchywitchy and apparently he doesn't. Godzilla raised his ugly head at one point and we spoke of who would win in a fight....Godzilla or Fred Itchywitchy. He reasoned carefully about Godzilla's powers and asked me what Fred Itchywitchy looked like. I told him he looks a lot like Godzilla only he scratches a lot. Unfortunately by now I was overtaken by a fit of giggles which quite spoiled the moment. Oh, I did have fun. This did me a world of good. I wonder if he has heard about "mountain cows" ? The old window is out and the new one in. I love the little glass blocks. It actually looks much nicer than it does here. It is difficult to get a good photo because of the light in the window. Saturday we didn't get out much. It was a lovely day, bright sunshine and a little warmer, but Marty was here working on the bathroom so we stayed put. Sunday, Philip got up first and then came back into the bedroom and said, "You are not going to like what I am going to tell you." "It has snowed. ", said he.. When I got up and looked out, I discovered that not only had it snowed, but it was still snowing and it was bloody, chuffing cold again. Not to be put off, we set off for CedarBurg. We had planned a little trip there as apart from being a nice place to go and peruse the shops, we also needed some time out of the house. My favourite shop is there. There is an old converted winery that is now filled with lots of little shops. The sort of lovely little shops you get quite often in England but rarely over here. Well, apart from holiday places, they usually have interesting shops. What a disappointment. My favourite shop, which was full of shiny things, has gone. It has been replaced by a shop selling overpriced, supposedly European (Irish, English and French) merchandise. They wanted $10 for a box of 40 Tetley teabags. Oh well, it was still nice to get out and about, but that place has lost its draw somewhat. It will still be lovely in the Summer as you can walk through the town and visit all the other little shops. No fun doing that when the weather is so cold. Sally runs away from Marty. She is a bit shy, but when he wasn't looking I caught her snuggled up on his gloves. He has a boy cat so I think she may be in love. Lily on the other hand could do with running away from Marty. She is a pain in the arse. She wants to be watching everything he does and he just managed to grab her as she was disappearing into a hole in the wall. He told me this hole leads to a space between the walls of the house and if he had missed her, she could have wandered anywhere around the house and it would have been a bugger to get her out. Today she has been twanging some metal trim he is going to use for the tiles. It makes a hell of a noise and made us both jump the first time she did it. She thinks it is great fun though. I heard Marty muttering and calling her a "little ship"....at least that is what it sounded like he said. Ok....this is a before picture. Tuesday morning the bathroom looked like this. We bought the tiles for the floor and the walls on Saturday. Marty came with us as the ones we chose were not suitable. We just don't know what we are doing really. He is brilliant. He talked to 'the man' in the store and knew what he was talking about. We always sound so stoopy when we try to talk to 'the men' in places like hardware stores etc. Anyway, tiles were chosen, trim was picked out and Marty collected it all in his truck on Sunday. Tuesday he came and started destroying the bathroom. I kept out of the way and let him get on with it. By the afternoon it was all ripped out. Amazing....he did it all by himself. This photo was taken as he was in the middle of smashing up the cast iron bath. He cleared it all up and took away all the rubbish. Yesterday he came and tidied everything up and then went to buy more bits. He phoned me to say the bath we picked out was pants. Lol......not his exact words but the meaning holds true. He had found us another one which was much better (not pants), would last a whole lot longer and was cheaper too. We told him that sounded marvellous and he should get whatever was best. He has been this morning to slap some stuff on the walls (getting technical now aren't I) and he is installing the new bath today. There is a new glass block window going in too!!! 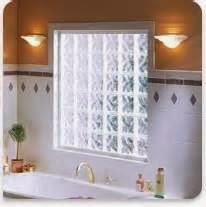 The glass block window will be like this. Well, maybe not quite as posh as this but still fab. The window is going in tomorrow. We have to go out and choose the paint tonight. This is not as easy as it sounds. I have picked up a million samples from a hundred shops, (well,quite a few anyway) and I change my mind every time I look at them. Hopefully we can find the right shade of teal...........tra la posh......and Marty will be happy with it. We know what sort of paint to ask for now, so we shouldn't sound too stoopy in the paint shop. Apart from the bathroom excitement nothing much has changed. We had one warm day and a little of the snow melted but then it froze overnight which made it worse. Today is very cold and there is meant to be some more snow. In the back garden the snow now only comes up to my knees so that is some improvement on coming up to my hips. Father Christmas x2....reindeer x 5......snowmen x 2......lighted Christmas trees x 4.....still cannot be budged from the ground. It is all still looking very festive in our front garden. Oh the lights are still all over the house too. I am sure the Easter Bunny will appreciate it. Picture of Tootsie just because she makes me laugh. Every time I clean the bathroom and put the rugs outside while I scrub the floor - she has to make herself a bed on them. She doesn't do it when they are in the bathroom. Ok...I will admit now that I am finding the archaeology course heavy going. It isn't difficult, as such, but it is so bloody boring. They seem to be going over the same thing again and again. It isn't the lecturer's fault as she has quite a fun, bubbly personality but the content is as dry as the sands of Egypt. The lecturer is very passionate about her subject and it is quite an important one I think. It is just a bit of a slog. Of course I will continue with it. I don't give up easily but I am not enjoying it as much as I hoped. Hopefully, I will do more of these courses but I think I will have to find something with a bit more oomph to get me fired up. I didn't expect Indiana Jones but I wasn't expecting it to be quite so repetitive. Maybe I should look for something more creative next time. I took this a couple of days ago. We have had more snow since then and the road has disappeared once more. There is more due tomorrow, Wednesday and Friday. It is not unusual to have snow storms here in March but what is unusual is how much snow (and ice) we have going into March. I am sure that has something to do with why I have been poorly. It seems I have pharyngitis and bronchitis. Don't remember having them before. I am very much better than I was but it does seem to be lingering on a bit. I have been studying my archeology course and I just submitted my first assignment. I get so stressed out over stuff like this. I wrote it, re-read it, re-wrote it, re,re-read it, re-wrote it again......then I re-read the topics and what the assignment should contain.........and then I re-wrote it yet again. If I fail I will be mortified. I have now received the second lot of lectures, and required reading, to go through this week. My nerves will be in shreds but at least it will give me something to do whilst I am confined to the house. It will keep my mind off the fact the poxy weather is keeping me stuck indoors instead of being out gallavanting. We seem to have found someone to do the bathroom. Right on our doorstep actually. A neighbour of ours does bathrooms (who knew?) and he has already measured it up and given us a shopping list of fixtures and fittings ("I'm free!! "), tiles, bath, bog, sink etc. Our first choice of tiles was a bit of a disaster. They are beautiful but when we worked out the cost (for the second time as someone miscalculated the first time and they seemed affordable), of these lovely tiles, it was around $1600. After sulking for a bit, because I had been led to believe they would be about $150......and to quote one of my former pupils - "I wasn't far out ma'am was I" - we went shopping again and may have found a much more cost effective alternative. I am waiting for our lovely man to come and inspect the sample tile we bought and let us know if it will work. If this all works out ok then we may be able to have the other bathroom done next year. I have had an enquiry about Merv's Hole. Just in case anyone is interested, Merv's Hole is being well looked after. He was out there, Thursday morning I think it was, in minus 30C (with windchill) armed with a dustpan and brush. He was sweeping little bits of ice from the sidewalk and around his hole. It was so cold I wouldn't even venture out to the dustbin.....even wrapped up in layers, coat, scarf, hat and gloves. But, Merv saw the necessity to brush his hole. Unbelievable.